Are you worried about the IELTS Listening test? Do you think it’s stressful to answer questions and listen at the same time? You don’t have to listen to every word and understand everything on the IELTS Listening test. Listening for detail: Listening for every word that the professor says and taking notes on everything they say. You might do this when you watch a movie and you need to hear every line. You don’t need to do this on IELTS. You do listen for details but you don’t listen to every word. Listening for gist: Listening for the main idea. You don’t do this on the IELTS exam. Listening for specific information: This is the skill that you need for the IELTS Listening test. This is a test strategy. On the test you look at the question, underline key words and then listen for those specific key words and the answer that is right next to them. Remember, you don’t have to understand every word on the IELTS exam. When you use these listening activities you should approach it the same way you would on the test. That means that you should read the questions before you listen. Focus on the key words like names, numbers, special verbs and nouns. Also, predict an answer. Know what to listen for- is it an adjective or a verb to go before one particular word. 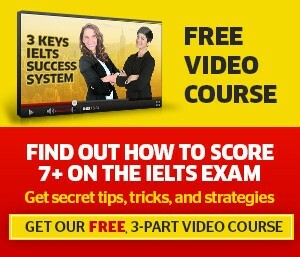 What aspect of IELTS Listening are you struggling with? Did this episode answer your questions? Let us know other questions that you have below in the comments.